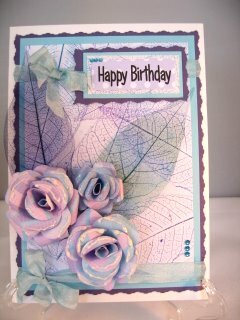 Another addition to your cardmaking stash are the fine delicate looking Leaves ... and they are delicate too, especially if you choose real ones. Added as a single embellishment or grouped together they create an individual look. 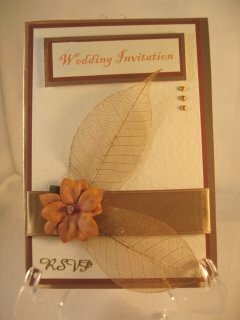 There come in a range of colours as well as metallic effects and they can be glittered or even embossed to alter the look altogether. Buy them in packs of mixed colors and they will go a long way, and they are not expensive. 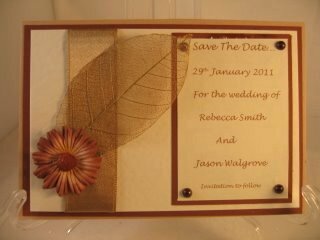 Add them as well to boxes, or your scrapbook pages, group them around picture frames and add them to your cards. By adding glitter, gemstones or other Embellishments you can give them a whole new look. But the choice of the Autumn colors sits well with the gold in the leaves and the satin ribbon. This could be the look you want to achieve for your Autumn Wedding. 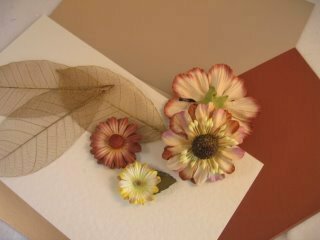 The ideas will flow once you buy your Skeleton Leaves and one idea is to try laminating them in a clear pouch and add them to the front of your card as the focal point.